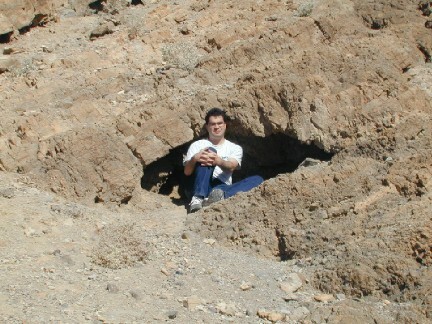 On Saturday (December 30) we drove up here to Death Valley. We had a slight miscalculation. We planned on entering the park from the East side which is the obvious choice given the highways. Well, Las Vegas is about 90 miles East of here. Having failed to celebrate the new Millenium last year, they decided to spend half-a-million dollars doing it right this time around. So traffic was excrutiating and we changed our plans, switched directions and came in the Western entrance. On Sunday morning, we started out each voting four (short) hikes we wanted to do. We then agreed upon the four that got multiple votes -- the four that Julie had picked. 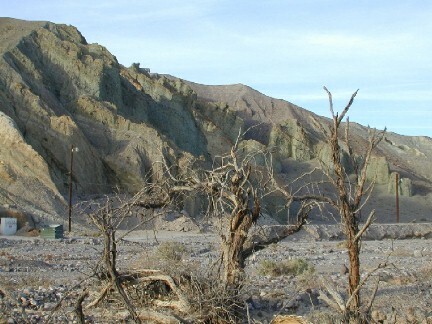 We then started by driving toward the one we'd all picked, Dante's Ridge, but took a wrong turn and went to Badwater Salt Flats (my pick) and the Natural Bridge Canyon (Joel's pick), instead. 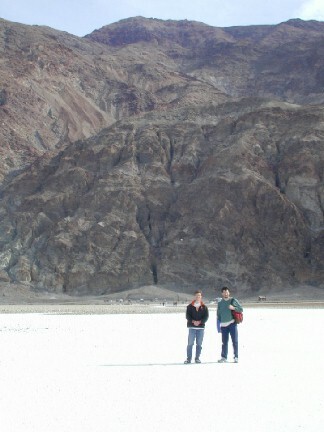 Badwater was cool! (Well, everything was cool.) 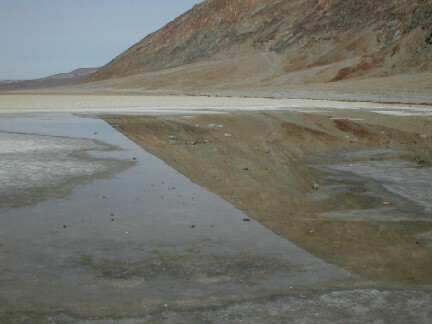 It's a big flat area covered with salt (hence being a salt flat). Next, to the parking lot was a spot 280 feet below sea level, and behind it up on the rocks was a large sign that said "SEA LEVEL." 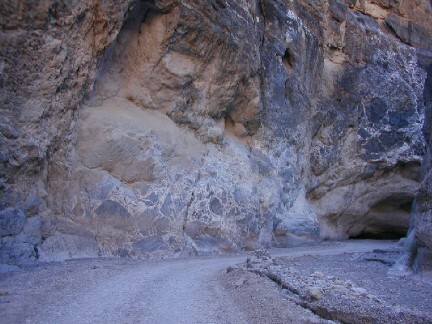 We played a bit there, and then went up to the Natural Bridge Canyon. All sorts of cool parts to this, but the rough dirt road up leading to the parking area was not among them. 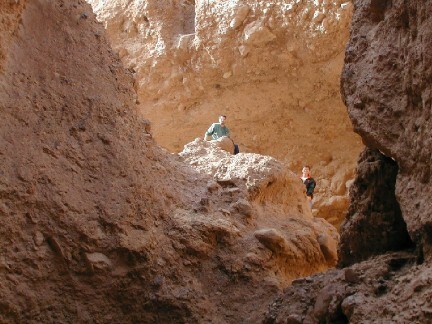 As you might have guessed we hiked through a canyon and saw a natural bridge that went over us. Joel and I, being the responsible souls that we are, climbed up to the bridge (about 30 feet up), and Julie stood where others wouldn't associate her with us. (Some friend.) :) Dry waterfalls were abundant and had this cool feature from the water evaporating on the way down and leaving the minerals to form "drippings" like wax from a candle. 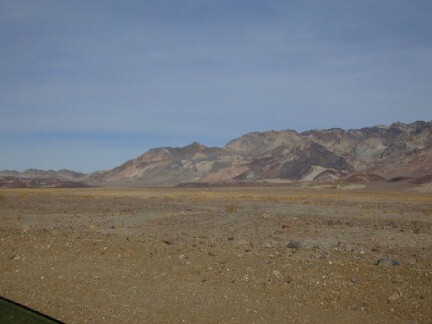 Driving back to undo our wrong turn, we passed (again) Artist's Palate, a cool looking mountain range which spans at least a half dozen colors. We also saw these cool looking pillars of rocks (about 20 feet tall and 5 feet wide). 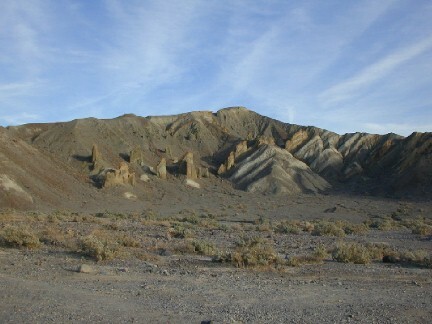 We then drove (and drove) to Dante's Ridge; it took us over 45 minutes to go the two miles from Badwater to the ridge. 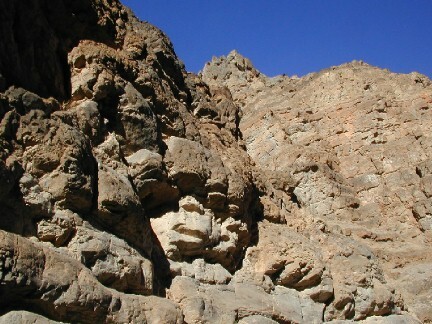 (The trip also included about a mile vertical climb.) 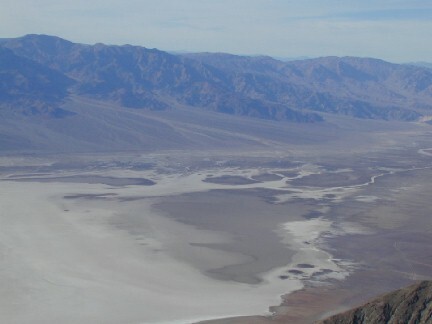 The ridge had an awesome view down over Death Valley including Badwater. It was really peaceful and beautiful. As dusk was coming, we hurried off to... 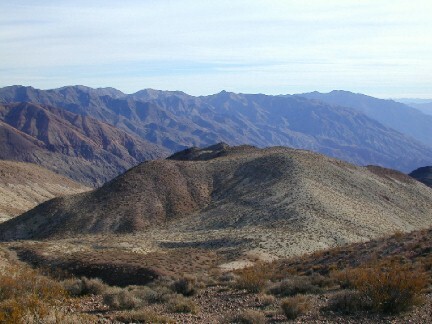 The Sand Dunes. We drove right by the entrance and had to turn around. Judging from the sides of the road, we were in good company. (Probably, because the entrance wasn't marked.) Here our quest was for tracks. We saw lots of human tracks, some dog prints, some bicycle tracks, and even some bird prints. But we failed to find the advertised sidewinder snake tracks. (Or maybe we just failed to recognize them.) We roamed out into the sand dunes for a bit under half an hour and watched the sunset as we went back to the car. The sunset was beautiful: brightly reddened skies flowing over a black mountain as their focus drifted along part of the range they showned over. The final darkness of this year (decade? century? millenium?) came with enough grace and splendor to remind me of what a beautiful world we live in... Now, if only we hadn't left the camera in the car for this one hike. We celebrated the New Year by taking a swim in the pool at our resort, a natural hot spring, and then watching fireworks on television. 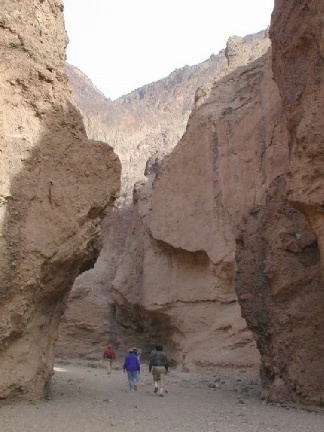 The next morning, we hiked through a narrow canyon with towering cliffs on either side. 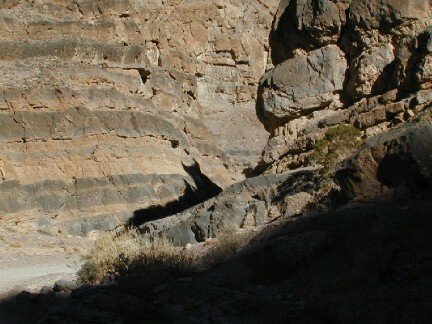 The cliffs cast some fascinating shadows, including a "devil cat" shadow. 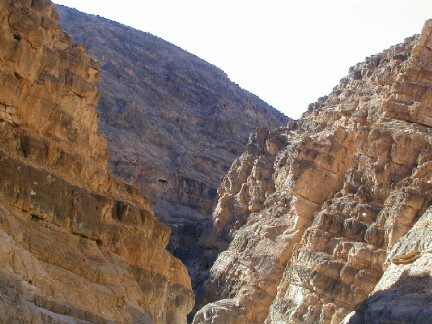 Acoustics within the canyon were interesting. The cliffs made for nice echos, but it was impossible to hear somebody shouting around the bend. 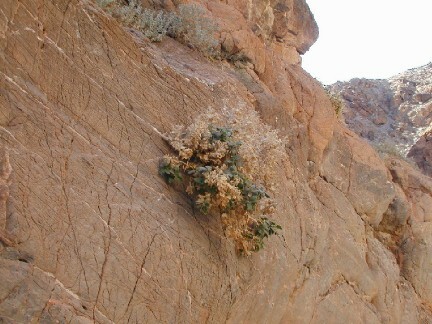 We saw some amazingly resiliant plants, able to survive in the relative coolness of the canyon by growing right out of the rock face. We got carried away with the camera on this hike!